Delmarva Power was incorporated in 1909, and is focused on providing safe and reliable service, connecting diverse communities and powering a 21st century economy across Delaware and Maryland. As a public utility owned by Exelon Corporation Delmarva delivers electricity to 500,000 home and businesses in Delaware and Maryland and delivers natural gas to approximately 129,000 homes and businesses in northern Delaware. Delmarva support the communities it serves, and has donated close to $5 million over the past five years to 750 organizations. 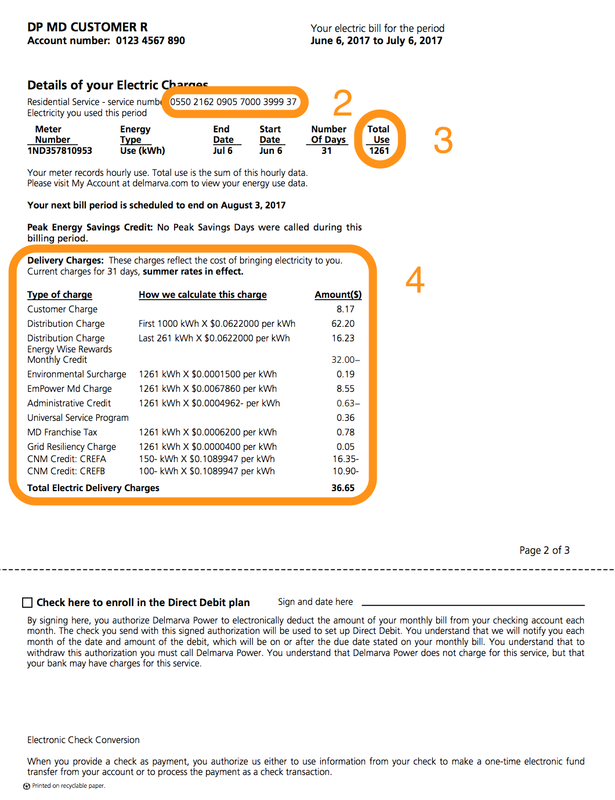 Click here to learn more about switching utilities in Maryland. 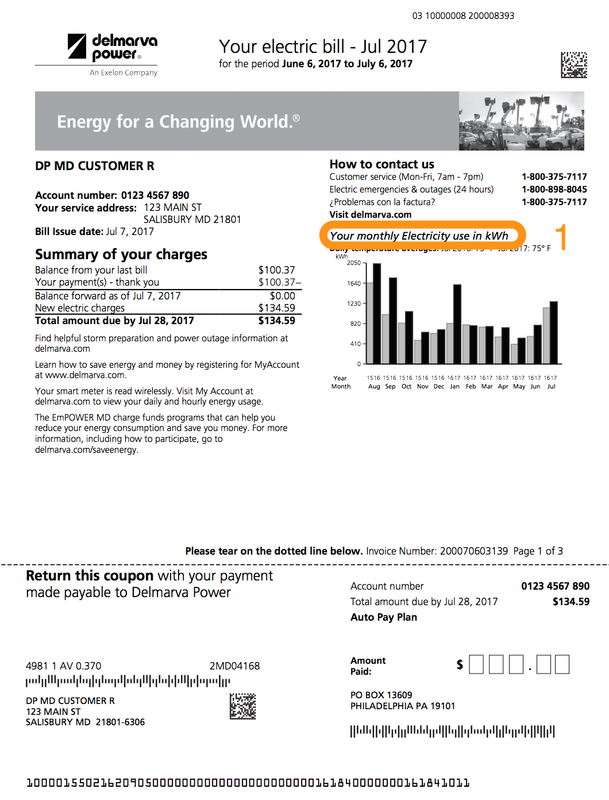 If you have questions on how to read your Delmarva energy bill, we can help. The most important portions of the bill are numbered and are explained below. The residential service number is what an energy supplier uses to transfer your account from Delmarva default power to the supplier power. Be careful to only provide this number to people and companies you trust. Total use is the total number of hours of electricity your home used during this billing period. This section details the cost for Delmarva to send electricity to your home. These charges cannot be changed or reduced by working with a competitive electricity supplier. Supply charges represent the cost of the electricity itself, not including delivery and taxes. Before switching to a competitive energy supplier check this area to find out what Delmarva charges you for energy, and be sure that the competitive energy supplier is offering you a lower rate or a greener rate. Total electric supply charges represent your total cost for electricity supply for the month. If you divide this by the total number of kilowatt hours used for the month, you’ll know your cost total cost per kWh. 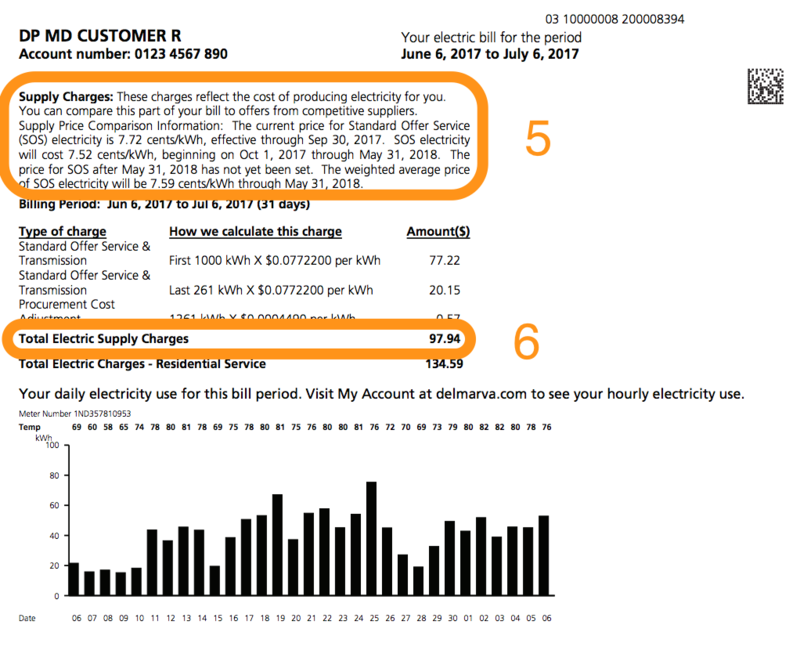 In this example, $97.94 divided by 1261 kWh = $0.078/kWh. If you have further questions about your Delmarva bill, and would like to speak with Delmarva customer assistance, call (800) 375-7117 M-F 7am-7pm or contact Delmarva online.